I've decided to put the 40K hobby on the shelve for now. I' in a process of figuring out who I actually am and who I want to be, and that kinda takes up all of my focus. Neither playing nor painting is really any fun at the moment, so I change my focus towards self realization through my tumblr. This is the last painting I've done for now. I did just manage to get one of them done, lacking basing before the motivation left me. I hope to return to the hobby once I got things figured out. Until then! So I decided to register my Warhound with the Titan Owners Club. The fact that every titan made by Forge World comes with a numbered certificate proving it is authentic and the production number makes the titan models a little bit more than "juts another model from FW" I believe. The Titan Owners Club aims to get as many of these numbered titans registered with the site for people to see, and by the looks of it, it works pretty well. You can sort by legions to see different takes on the legion colours which is pretty cool. "Target sighted, ruined building type imperial, first through 3rd floor, within range, distance: Far. Probability of total neutralization: 45%. Take aim, fire at will sanctioned. Omnissiah be praised." Ferrodir 4-Gyros chimed in binary to his assigned ranger squad. 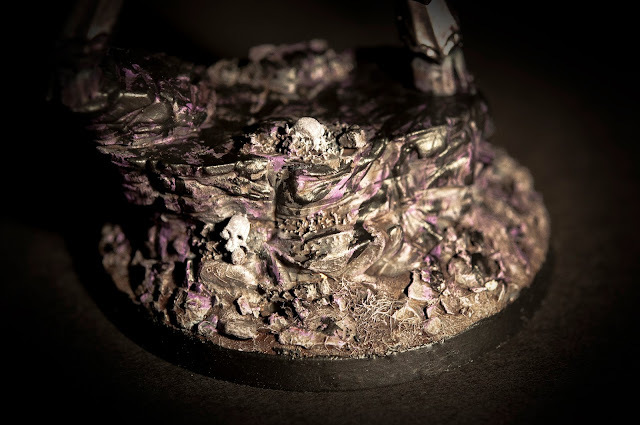 The message, received and understood within fractions of a section, and the whole squad opened fire upon the dark eldar hiding across the street. The nearby guardsmen, oblivious of the enemy presence startled turned their heads looking in all directions, trying to get a glimpse of what the vigilant Skitarii had observed, analysed and fired upon by the time it takes for a single breath. I faced off against Chris today and his mighty Dark Eldar with attached "dark eldar" wraith knight. 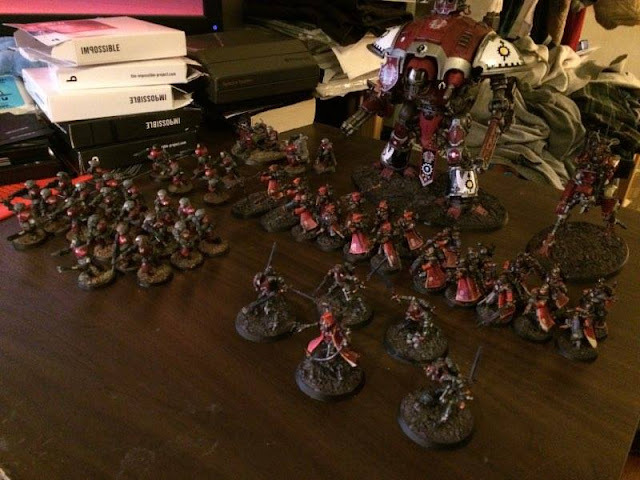 My forces mainly revolved around the Skitarii taking up the bulk of the points, but also my House Taranis knight warden and a allied detachment of guardsmen from the 501st to bring up the numbers. The point limit for the battle was 1250 pts. The field of battle, 4' by 4'. My deployment zone was rather cramped by people wanting to run forward as soon as possible. This was my first time playing Skitarii and I feel I did not play them optimal at all. I had a lot of problems getting them within range, especially the vanguards that spent most of the battle loitering around mid field not really in range of anything. They did however gain me a victory point (playing maelstrom) when the brave Alpha, the last one alive in the squad by turn 5, charged in against the dark eldar just disembarked from a wrecked skimmer, dying by overwatch gaining me the "Survival is nothing, Data is all" objective. Last stand of the Vanguard Alpha shortly before charging the dark eldar troops disembarking from the closest skimmer. 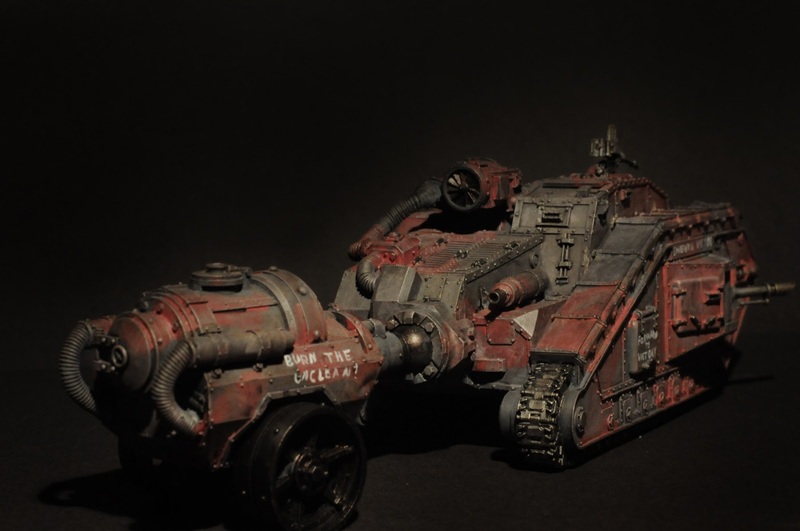 The knight was the main motor behind my forces this match (it usually is, but especially this time), evening out for my poor play of the Skitarii. In turn 1, it failed its charge against the wraith knight due to poor rolls, ending up being charged by it instead. The wraith knight rolled poorly on his attacks, hitting only once taking 1 HP off the knight even with a destroyer CCW. The knight in return hit on all 3 attacks resulting in a total of 8 wounds from the destroyer table, killing the wraith knight. My knight then moved on to taking out 2 skimmers full of dark lances, shooting at infantry and pretty much whatever it got n sight, effectively clearing the left flank of the table. With the avenger gatling cannon, it even managed to kill Chris' Archon, Ozzy even with a invul save of 2+. Got to love that gun. Dominating. The knight take up a lot of points, but as long as it stays alive it delivers a ton of damage and can efficiently grab objectives with the 12" move. My warlord, Ferrodir 4-Gyros was providing covering fire from one of the buildings for most of the battle. With 30" range on the galvanic rifles and 60" of the arquebuses they were one of the few units in my army that actually had range to hit stuff from turn 1. They delivered some devastating fire early game, but by that marked themselves as a hot target and drained a lot of fire. By the end of the battle, Ferrodir 4-Gyros was the only one left standing, denying the dark eldar slay the warlord. Fight me? Now why on earth would you do that? I'm just standing here behind this wall calibrating the data blocks for the rest of the army. Move along now! As for the ruststalkers and the dragoon they came by far the worst out, not able to deliver any damage at all during the cause of the battle. The dragoon took fire from 3 dark lances turn 1 so little I could do about that, but the ruststalkers I could have played better. I even had them in charge range at one point, but forgot charging them due to all attention being caught up by the amazing things happening around the knight. Dunestrider really helps by adding 3" to any movement, but they took a lot of fire on their way across the board. I'm not quite sure how to play them as there rarely is enough cover to prevent losses until the close combat. Ready to run. The dark eldar had no plans for moving any closer. Overall a good and even match. The facing off of the knight and wraith knight was kind of a game turner and we both know the result of their engagement would be defining for the battle. This time the dices was in my favour, and like I said earlier on, the knight carried the army the rest of the battle. No doubt I'm going to keep playing Skitarii, there is not much to not like about them, from gear, to the models to the fluff, but they remain semi-expensive glass cannons. Once I learn to tackle that, I think I'll be able to put them to better use. The battle is over. Remnants of guardsmen cling to cover and the dark eldar skimmers hide from the knight. With line breaker, slay the war lord and a bunch of objective, the battle ended 9 - 6 in my favour at turn 6. I played the Skitarii deck and got some of the fun new cards keeping in line with the Skitarii fluff. Until the last turn with line breaker, the score was never more than 1-2 points in difference so I'd say it was a even match. With the victory on Nest, I captured one sector on the planet from Chris and due to my Relentless Assault campaign rule claimed yet another sector on Tresium. Truly a glorious day for the Imperium and for Omnissiah! EDIT: As a friend of mine pointed out, I forgot all about the scout move granted by the Sktarii Maniple. That extra 6" would have meant a lot for the vanguard and ruststalkers. I'll make a not of the until next time. Objective completed, sector secured. Enemy forces routed, great losses on both sides. Lots of new data to analyse from the engagement. New profile type registered for [Dark + Eldar(?) + Wraith Knight.] Upload started. Estimated processing time H:42M:52S:27. Permission to return to mechanicum base of operation requested. Ferrodir 4-Gyros out. ....Access granted...... Magos is satisfied by the results, return for further personal sensor data analysis. More Skitarii done, which concludes my current batch of based and primed models. With this last addition, my Skitarii forces numbers 10 vanguards, 10 rangers, 5 ruststalkers and one dragoon, enough to field on their own without having to bring the knight. I have not yet started on the "start collecting" box, but next up is going to be Cult Mechanicus, taking a break from painting Skitarii now. One year has passed since I created this blog and I got to say I am rather proud of myself for keeping it alive through the whole year, even with no more than a post or 2 per month. 40K is a time consuming hobby and during stressful periods, you just got so much time to spend. 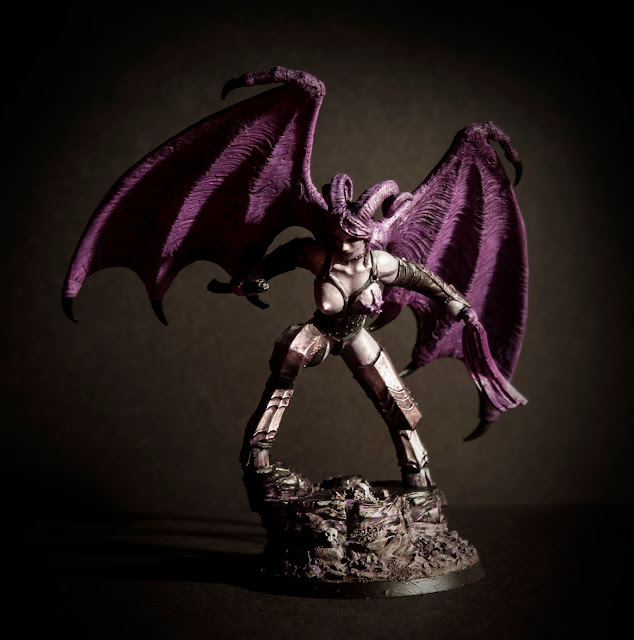 Here is to another year active on the blog, improvements in painting and more winning.... 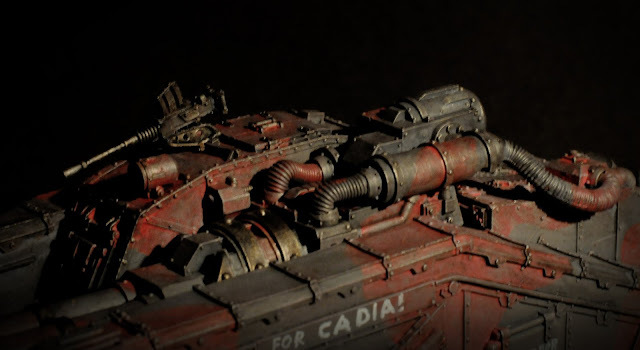 I hope :) The upcoming new AM codex and a combined AdMech are reasons for excitement, and along with the new codexes, hopefully some new units as well. Got to love those transonic blades. Mine are not quite as detailed as the 'Eavy Metal team does them, but hopefully I'll get there in time. Might have to re-paint this guys some day, not entiiiiierly satisfied. More special weapons to go around. With the models from the "start collecting" box I'll have 3 of each type to field with 3x 10 man squads. 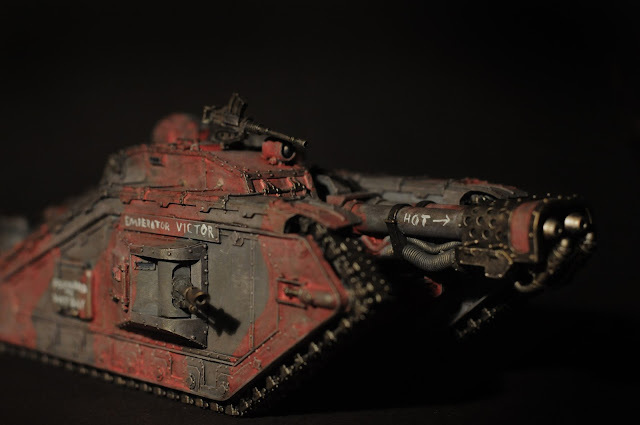 You will be next, alien and/or heretic and/or chaos spawn and/or other not favourable of the Imperium and/or the Omnissiah and/or the Emperor! Too bad they are not characters, I would easily nominate a dragoon my warlord when fielding Skitarii alone. Scratched paint detail on all the bone coloured chassis. I tried following the instructions from WD 61 to some degree of success, but with more practice I hope to improve my brushwork with the detail brush. He got a cool cockpit with a lot of instruments boosting Ld of nearby troops. The ever growing forces of the Red Planet. Omnissiah be praised! First time in ages I do some proper kit bashing. Today I'm assembling my custom Kataphron Breachers and Destroyers from the original GW kit and FW Vorax Battle-Automatas. My custom Kataphron are in reality servitors hard wired in to to robot bodies, not automatons. Like the original Kataphron, they living and breathing in agonizing pain just like Omnissiah intended. Kataphron Breachers with heavy arc rifle and arc claw. Om nom nom vehicles. Added a few bits and pieces to try make the look more armoured than the Destroyers given the difference in armour save. Kataphron Destroyers with plasma culverin and phosphor blaster. Less armoured, but more ranged damage output. Heavy infantry beware! The entire happy family together. Looking forward to painting them. The painting scheme is based upon the Mars scheme presented in White Dwarf #61 but with a tad darked red tones to match the rest of my Imperial forces. The plan is to field Vanguards and Rangers at a ratio 2:1. Got to love the rad poisoning rule. 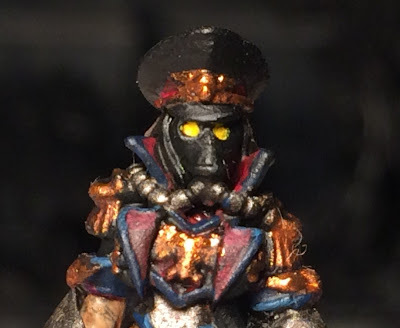 Also, did I mention the Skitarii infantry is the most detailed models I've ever painted? Feels like an eternity just to paint 5 of them. The rangers are cheap for a precise 30" "sniper", but offer little more than the precision shot rule, Hence why I'll focus more on the vanguards. Wasp stripe pattern on the cables are fun, but wish I was able to get them thinner. More practice needed! I've been painting my Slaanesh daemons lately and at last the basing is done as well! With 10 daemonettes and a daemon princess, I am still 10 daemonettes short of a playable army but I'm getting there. This first batch was a test run of the colour scheme and basing technique, both of which I think works pretty well. The "corruption spreading-basing" got potential for improvement, but as a fist try I'm satisfied. More to come, next on the list is Skitarii. Hades is a ageing Malcador 'Infernus' of the 501st recently pulled out of retirement in a dusty storage bunker on the home planet. Though the paint is old and faded, the newly painted slogans are bright and encourages nearby guardsmen safe in the knowledge that wherever the mutant, the heretic or the alien is hiding, Hades' cleansing flames will find them, reducing them to pious ash in a matter of seconds. 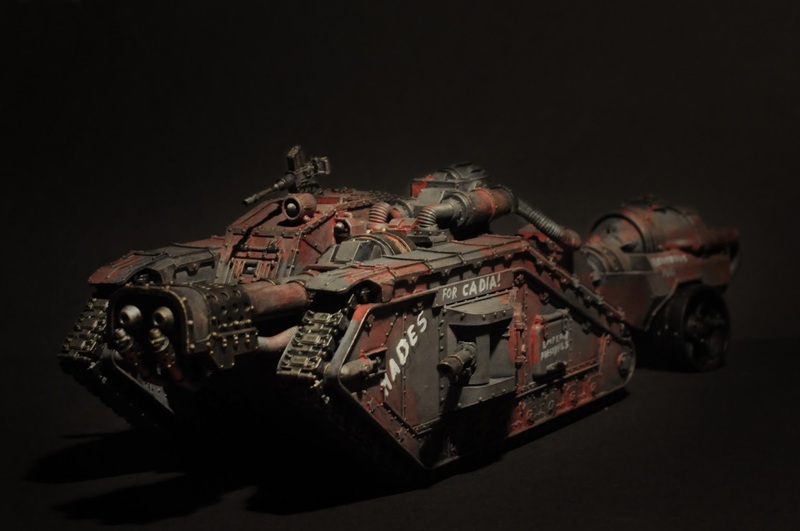 Hades is, due to the old and faulty engine of the Malcador class tanks, known for showing up late wile in reserve, and for turning in early wile finally on the table. It is almost like the enemy don't like its presence. Emperor preserves! Hades was recently featured on Faeit 212, thanks Natfka! As things are not going well for the Imperial faction, a new commander have been brought in to oversee and lead the 501st Foreign Legion. To make sure the force stay on the righteous path, true to the Emperor, the Commissariat found it necessary to oversee the campaign personally. Following the Mothballed crisis mission (of which we lost badly), each warlord taking part (I was using a proxy for Maxine as she was not painted up yet) got to choose one fixed warlord trait that stick to the character. As the imperial seam to lack any strategic plan to date, it was fitting choosing the Grand Strategist trait from the AM codex. Let's turn this ship around! Skulls! Friend or foe, she shoots both if the Emperor demand it. Why yes, of corse she does cause fear!